Do you run a web service or hosting company? Do you like transparency? Then this might be of interest to you. Service status blogs are becoming increasingly common these days and are usually very appreciated by users. Look no further than Twitter’s famous status blog, or the Google Apps status page. Status blogs (or “status pages”, depending on approach) may look and work differently, but they all serve the same purpose, informing users about service issues. Now it’s easier than ever before if you want one, or want to make your existing status blog even better. To make it really easy for companies to offer a comprehensive status blog, we are now releasing a free Pingdom status plugin for WordPress. Using this plugin you can combine Pingdom’s monitoring with the world’s most widespread blogging platform. A public status page. It creates a page on your WordPress blog which shows the current status (up or down) of the sites and servers you monitor with Pingdom. Monitoring history. 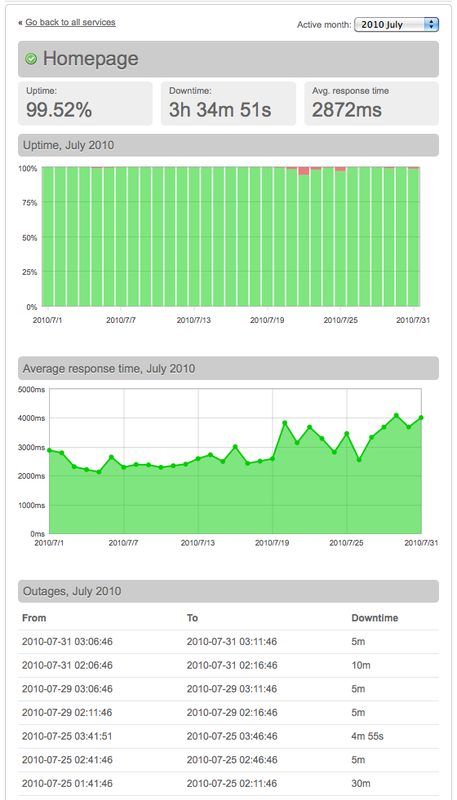 Users can drill down and view detailed uptime and response time history for each monitored item. Make all or just some results public. You can select to make all your monitoring results public, or just some of them. Often companies have additional monitoring set up that may not be directly relevant to their users. Grouping. You can create groups of monitored items and name them, for example “web servers,” “database servers,” “websites,” etc. This makes it easy for you to categorize the results for your users. Default or custom design. The plugin comes with an attractive default styling, but you can modify it as much as you like, for example by adding your own colors and branding, etc. All you need is a Pingdom account and a WordPress blog. Once you have that, setting up the plugin won’t take more than five minutes. To get started, just follow the plugin installation instructions. All settings are done inside the standard WordPress admin control panel, in the Plugins section. In the above case we have created a group named “Websites.” You can of course have multiple groups. This plugin was designed for self-hosted WordPress blogs (i.e. 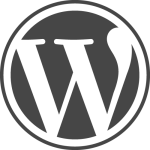 using the WordPress.org software). It won’t work for blogs hosted on the WordPress.com service. Also, a small but important thing to keep in mind: Host your status blog separately. If your main site or service goes down, you still want your status blog to be accessible. In case you arrived here not familiar with Pingdom, we offer a service that monitors websites and servers for our users, sending alerts if errors are detected, and providing a control panel where our users can examine their monitoring history and troubleshoot problems. We have tens of thousands of users, ranging all the way from large corporations to hobbyist webmasters. You can read more about our features at www.pingdom.com. Pingdom has paid monitoring packages starting at $9.95 per month, but also a free package for monitoring one site. I installed the plugin automatically with the plugin browser. @Fredrik Poller: We’re working on fixing that. An update should be up very soon. This is awesome ! I love your service! The plugin doesn’t activate, with fatal errors about missing include files. assume the content dir is always in the same place, and the plugin directory is always PingdomStatus (which it isn’t when you use the auto-install). @Roger Theriault: Thanks, we’re aware of it. We’re testing a fix now, uploaded shortly. Ok, everyone. Thank you for the quick feedback. The problem with auto-install should now have been fixed (we’ve tested it, and it works fine). Apologies for the inconvenience. We’ve uploaded a version 1.1.1 to WordPress now that properly supports the auto-install feature in addition to manual install. If you run into any problems, remove the old install before you install the new one. I seem to be getting a 404 when clicking on a monitor name. Any ideas why this would be? Found the problem. Seems it doesn’t like you creating another page and setting that as the homepage. When should it start generating graphs? Mine have been blank for about 12 hours. @Dan Knights: It’s supposed to work right away, right after you’ve synched the first time. If you have a brand new Pingdom account, though, the graphs won’t have much to work with since you have almost no monitoring history (i.e. the graphs show one month, and if your account is hours old, there’s not much to show on that scale). Thanks, it is a new account but I would have expected to see some points on the graph within a couple of days? It’s still blank at the moment. @Dan Knights: Please send an email to support -at- pingdom.com and we’ll have a look at it and see if we can help. Don’t forget to include a URL to your status blog. I follow through to a check to see the reports. It goes to this link. Loads just fine and it works. However on that page the top link on the left that says “« Go back to all services” does not work. It links back to this link. Other than this little bug it appears to work great. @Donnie: Thanks for the heads up. We’ll have a look and see if we can find out why this is happening for you. We’ll be in touch via email. It would be cool to have a widget that can be placed on the page. I see a folder called widget, but it’s empty. I am getting a 404 when clicking on a monitor name. Whats da solution. Please reply. @Kumar: Sounds strange. Please send an email to support -at- pingdom.com explaining your problem a little more in detail (including a URL if possible) and we’ll see what we can do to help. I receive an error when I click at “Public checks” in the WordPress Plugin Settings. @Tobias: Very strange. Would you mind emailing support -at- pingdom.com with some more information? For example if you’re experiencing this on any of the other settings pages? Plus, what Pingdom account you’re using. Please do that, and we’ll see if we can find out what’s happening. Why does it cause the site to hang for roughly 5 seconds? What is this script doing? 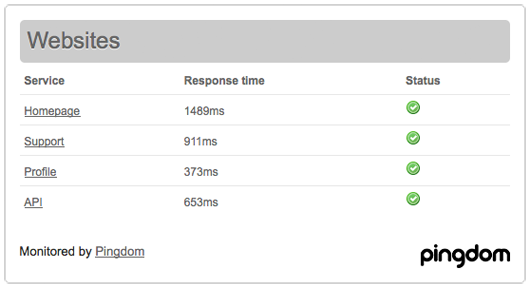 I thought the plugin only displayed the data already on Pingdom servers to display the graphs and charts. Any assistance would be helpful. I can’t justify the site hanging for 5 seconds while the page loads. Any update on this? I would love to integrate my pingdom data on my wordpress install. @fbjbayless No, unfortunately we have nothing that we can announce at this point regarding this. Looks like this plugin is no longer available, is that correct? Any reason why it was removed?